Accurate geometry definition is critically important, and TGS Canada Corp.'s (TGS) respect for this First Rule of Processing led us to write Geom, a superb interactive front-end application used for picking first breaks and for geometry generation/verification. Geom allows processors to build the strong foundation needed for high powered downstream processing. Below we showcase a sampling of some key Geom functionalities. Specifically, we discuss interactive geometry correction, crooked line binning, and map displays. 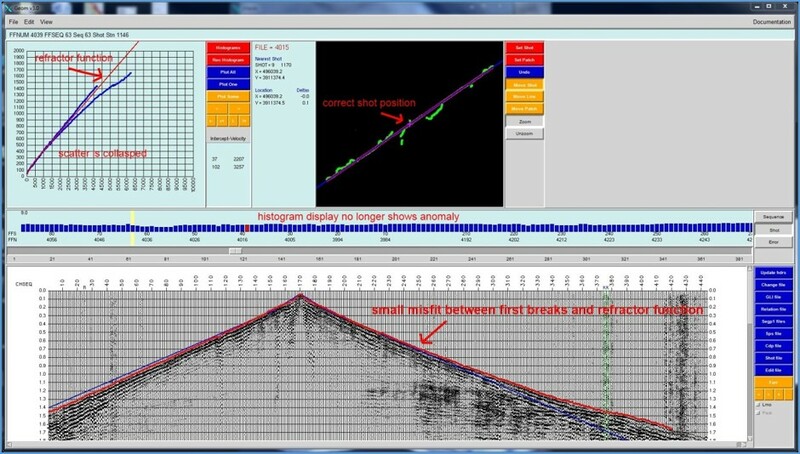 The second main QC usage of the refraction function is for rapid identification of potential geometry errors across the survey at large, rather than within a particular shot. Specifically, for each shot a single QC value is calculated representing the difference between the first break picks and the corresponding times on the refractor function. This QC value is presented on a histogram plot for comparison with other shots (middle pane of Figures 1 and 2). By examining relative differences in the QC values, the processor can quickly identify outlier shots whose values deviate largely from the norm. Such shots would indicate additional potential geometry errors and would warrant further investigation. Figure 1 shows the picks for a shot from a 3D land survey. The picks are displayed by offset with a user‐specified linear "refraction function" overlain in red. 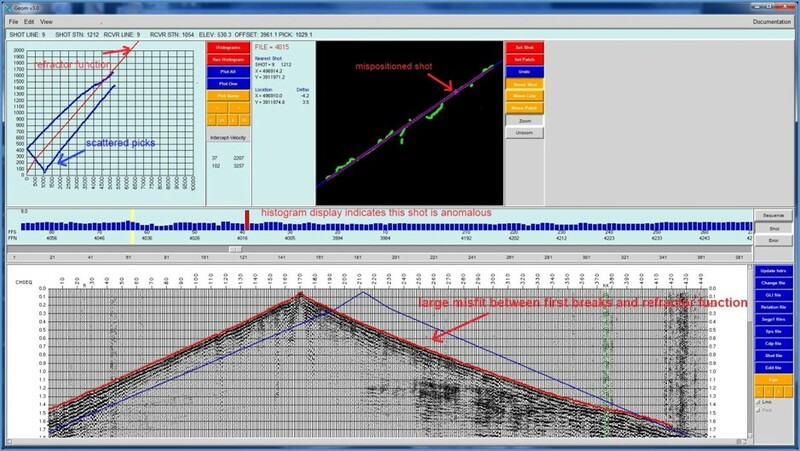 This refraction function serves as an important QC tool in two distinct ways. First, within the context of the shot at hand, geometry correctness is quickly confirmed by observing the pick positions relative to the refraction function line. If the picks (in blue) are tightly grouped and closely track the refraction function (in red), the geometry/patch has likely been correctly specified; on the other hand significant scattering of picks indicates a geometry problem which must be fixed by the processor. In this case, we indeed observe a high degree of scatter related to a geometry error. The error may be fixed by dragging the location/patch/receiver line to collapse the scatter as illustrated in the interactive geometry demo, and the result of this correction procedure is shown below.